Posing as a beach bum while investigating the local drug trade, journalist Irwin 'Fletch' Fletcher is approached by a well dressed man with a proposal. All Fletch has to do is show up at the man's house, shoot him dead and he'll be rewarded handsomely. Intrigued, and with his drug story stalled, he agrees to the deal and begins to investigate, little suspecting the danger he's about to put himself into. He'll have the story of his career, all he has to do is live long enough to write it. Irwin Maurice Fletcher, or Fletch, was created by author Gregory McDonald and made his debut in a 1974 novel. McDonald was a Harvard graduate who had put himself through college by operating yachts. After graduating he worked as a teacher and then a journalist, whilst writing his first book, Running Scared (1964). He left his job at the Boston Globe to concentrate on writing full time, and in 1974 released the first book to feature investigative journalist, Fletch. It was a huge success and won an Edgar Allen Poe award for best paperback original. McDonald has stated that he never intended to write a sequel but the success of the first book was overwhelming. Before long he was back writing, and in 1976 released Confess, Fletch. This too sold in great numbers and earned the author another writing award - the only time in history that a book and its sequel have won back to back Edgars. Hollywood soon came knocking and the rights to Fletch were snapped up by Universal Pictures. However, McDonald wisely had a clause written into the contract that gave him veto over who could play Fletch. Anyone who was anyone wanted the role, and the author passed on, amongst others, Mick Jagger and Burt Reynolds, who was arguably one of the biggest stars at the time. The studio then put forward the name of Chevy Chase, and despite never really seeing him in anything previously, McDonald agreed on his casting as Fletch. This wasn't the first time the Saturday Night Live star had been considered for the part - according to movie legend, years earlier Chase's manager had urged him to read the novels with a view to him playing the role. At the time the actor was balancing a number of projects and wasn't interested. However, when producer Alan Greisman became involved, along with screenplay writer Andrew Bergman, Chase came on board. By the time he took on the role of Fletch, Chevy Chase was already a popular TV star, with a budding film career. He was born in 1943, to parents Edward and Cathalene Chase, a prominent book editor and concert pianist respectively. He grew up in New York (the family are native New Yorkers in every sense of the phrase, being able to trace back their ancestry in the city some fourteen generations) and attended Riverdale Country School before being expelled. He eventually wound up at Haverford College, where he quickly gained a reputation for slapstick, and created a long-running urban legend - that he was expelled again for keeping a cow in his room (Chase would perpetuate this myth for many years despite his roommate revealing in 2003 that the actor left of his own accord, for academic reasons). Chase graduated in 1967 but did not go on to study medicine as he had planned at one point. By not continuing his education, he ran the risk of being drafted, but managed to dodge the situation by implying he had homosexual tendencies. Chase got his first break into comedy that same year by co-founding the comedy ensemble Channel One. He would go on to contribute to MAD magazine and provide jokes and sketches for the Smothers Brothers, before taking up comedy full time. He appeared on National Lampoon's Radio Hour alongside John Belushi, Gilda Radner and Bill Murray, who would all go on to feature on the Saturday Night Live precursor, NBC Saturday Night. He made his feature film debut in The Groove Tube (1974), a low budget comedy that satirized commercial television, directed by Channel One co-founder Ken Shapiro. In October 1975, when Saturday Night Live launched, he was part of the cast, and had the honour of opening all but one show of that first season with the immortal line "Live from New York, It's Saturday Night!" He soon became known for his sketches, particularly the Weekend Report, on which he contributed material. Curiously, Chase was never actually meant to be part of the cast of SNL, he was contracted for a year as a sketch writer. He only became a cast member during rehearsals for the premiere. The actor proved incredibly popular and went on to win two Emmy awards, and a Golden Globe. It was therefore something of a surprise when he opted to leave the show at the end of his contract. Some attributed it to the film offers that were now pouring in, but in reality Chase's girlfriend didn't want to remain in New York, and the pair ended up moving to Los Angeles and marrying. For season 2 of SNL, Chase would be replaced by Bill Murray. The role of Eric 'Otter' Stratton in National Lampoon's Animal House was written with Chase in mind, but he turned down the role to play opposite Goldie Hawn in Foul Play (Tim Matheson, who would co-star in Fletch, wound up playing Otter). He then appeared in Harold Ramis' Caddyshack and reteamed with Goldie Hawn on Seems Like Old Times. In 1983 he appeared in the role for which he is most commonly known, that of Clark Griswold in National Lampoon's Vacation. The film, written by John Hughes and based on his short story, Vacation '58, was a smash hit in the latter half of the summer of 1983, making $61M on a budget of only $15M. It was also a critical success too, with almost all the reviews being positive. Yet, despite being on top of the world, Chase was using cocaine on a daily basis, and had been for a number of years. His increased usage was making him paranoid and difficult to work with, and was said to be the reason for the break up of at least one of his marriages. By the time Fletch came around, the actor had sought help for his cocaine (and alcohol) usage, but Universal still weren't sure he could be relied upon. To go some way to ensure Chase stayed on the straight and narrow, they employed veteran director Michael Ritchie to helm the project. Ritchie also had to contend with author Gregory McDonald, who hated the script and what they had done to his story and characters. Screenwriter Andrew Bergman had made a name for himself writing comedy - his first script, Tex X, became the basis for Mel Brooks' Blazing Saddles. He produced the first draft for Fletch in just four weeks, which was, to all intents and purposes, a very loose adaptation (The shooting script would receive another pass by Phil Alden Robinson). Gone was Fletch's military background, along with a number of other changes that McDonald objected to, including one imagines, the increase in comedy. He went through the script and highlighted his every grievance to the studio. Wanting to keep him on side, Ritchie invited McDonald onto the set to see filming taking place. Afterwards, over dinner, the director went through every single issue the author had with the screenplay, and explained why he was wrong. When he took on the job of directing Fletch, Michael Ritchie already had more than 25 years directing experience behind him. In his final years at Harvard, he had produced a version of Kopit's play, 'Oh Dad, Poor Dad, Mamma's Hung You in the Closet and I'm Feelin' So Sad'. This bought him the attention of producer Robert Saudek, who offered him the chance to direct an episode of Omnibus entitled Saint Joan. From there he went on to direct episodes for a number of popular TV shows of the time, including Dr.Kildare, The Man from U.N.C.L.E and Run For Your Life. He made his feature directorial debut on the 1969 picture Downhill Racer, the first of a number of sport themed movies he would make. He re-teamed with Robert Redford (star of Downhill Racer) on the 1972 satire, The Candidate, before having a smash hit with The Bad News Bears. Despite a few misses over the years, Ritchie was seen as reliable and experienced director. 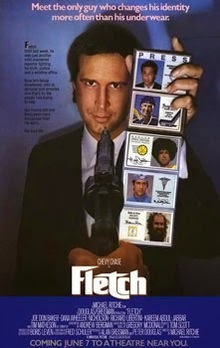 Fletch would be the eleventh movie of his career (discounting an uncredited role on Student Bodies). In addition to Chevy Chase, who would feature in almost every scene of the film, Tim Matheson would play Alan Stanwyk, Joe Don Baker took on the role of Chief Jerry Karlin and newcomer Dana Wheeler-Nicholson appeared as Stanwyk's wife, Gail. As previously mentioned, Tim Matheson took on the role in Animal House intended for Chevy Chase, yet by that point (1978) he had been acting for almost 18 years, in all kinds of roles across numerous genres, including voice over work on Jonny Quest and Sinbad Jr. Joe Don Baker was similar, and found himself in the public eye thanks to the unexpected hit, Walking Tall, based on the life of sheriff Buford Pusser. In stark contrast, Dana Wheeler-Nicholson had had just two minor roles prior to appearing in Fletch. The remainder of the cast was filled out by George Wendt, Richard Libertini and Geena Davis. With a May 1985 release date in place and an $8M budget to work with, Ritchie got production underway in and around Los Angeles. He was more than aware that he had to keep Chevy Chase occupied, and allowed the actor to improvise many of his lines. In an interview given to the A.V Club in 2009, Tim Matheson stated that Ritchie would shoot two takes for most scenes - the first would be as scripted, while on the second he would allow Chase free reign to do or say as he pleased, within reason. This had the effect of not only keeping the actors on their toes, but creating some of the best lines and reactions in the movie. Chase would later claim he 'winged' most of the shoot, seeing Bergman's script as little more than a guide to the plot and action. He stated that much of the dialogue was unscripted, and he would often make up names or directions on the spot. With little in the way of actions sequences, shooting went smoothly enough and work soon began on assembling the finished movie. The director had to sift through a great deal of footage thanks to the improvised nature of the shoot, deciding what played best for any given sequence. The initial cut ran far too long and had to be edited down to a tight 95 minutes (without end credits). This meant a second dream sequence was removed (Fletch being called to pitch for the Dodgers) and a voiceover track was added to help the audience keep track of the plot now that some of the exposition had been removed. Very late into post-production, composer Tom Scott was replaced by Harold Faltermeyer. There's scant evidence as to why this took place, other than Scott's work seemed very jazz noir, which may not have fit with what Michael Ritchie was after for the film. Harold Faltermeyer, a one time protégé of Giorgio Moroder, had seen huge success with his work on the Beverly Hills Cop soundtrack, which in turn spawned the hit single, Axel F. He bought his distinctive sound to Fletch, but revealed in October 2014 that things could have ended up quite differently had it not been for Billy Idol. Around the time of Fletch, Faltermeyer was already at work on the Top Gun soundtrack (it would be a rare instance where a soundtrack was all but completed before a film was shot). He’d created a piece of music that would be used as Fletch's theme, but friend Billy Idol, who was recording close by, convinced Faltermeyer to use the song on Top Gun instead. The composer agreed, and crafted a new piece of music for Fletch. 'Fletch's theme' went on to become one of Top Gun's memorable anthems. As mentioned, the change in composer came very late in the film's production - Tom Scott's name was still listed as composer on the initial posters and trailer. Reviews for the movie were generally positive, though more than one critic mentioned how Chase's performance was so casual and knowing, that at times it took you out of the picture. Roger Ebert, in his two and half star review summed the film up as needing 'an actor more interested in playing the character than in playing himself.' At the time of writing it holds a 75% approval rating on Rotten Tomatoes. Fletch was scheduled for an early summer release. While Chevy Chase was now a major star, the picture wasn't expected to be a runaway success - and with an $8M budget attached, it didn't need to be. There would be competition, both direct and indirect, on all sides. The Richard Pryor comedy Brewster's Millions had opened the week before to the tune of $9.8M, while the second Police Academy film, Their First Assignment, was still going strong after two months on general release. Inexplicably, Beverly Hills Cop was also a very real threat despite having opened some six months previous, in the December of 1984. The Eddie Murphy vehicle had been at number one for thirteen straight weeks, and while it had fallen to the lower rungs in March and April, it was back in the top five come May. There was also the second weekend of Rambo: First Blood Part 2 and A View to a Kill to contend with. In true Fletch style, the picture hit the ground running, making a solid $7M from its 1,225 screen count during its opening weekend. By the middle of that first week, it had already recouped its production budget and was bracing itself for the release of The Goonies and Perfect. While the former knocked Fletch down a place, the latter barely had an impact. Even with the increased competition, the picture held exceptionally well during that second frame, taking a further $6.3M (a fall of just 10% on the previous weekend). The film continued to play well and by the end of its fourth week on general release, had made over $30M. Even up against Back to the Future, which opened on Fletch's sixth weekend of release, the picture managed to earn $2.3M and fell 22% on its previous frame. All up Fletch made $50.6M in North America and a further $9M overseas, against that budget of $8M. It was the 12th biggest film of 1985, beating out the likes of Commando, Teen Wolf and Brewster's Millions. Chase had two other hits in 1985 - Spies Like Us (which would become the tenth biggest film of the year) and National Lampoon's European Vacation (which made just over $50M). Along with Sylvester Stallone and Michael J Fox, Chevy Chase was one of the biggest stars of the year. The film performed strong on video, earning over $24M in rentals. Universal knew a good thing when they saw one, and with more books to adapt, hoped they had the making of a franchise. However, it would be four years before Fletch returned to the big screen. In the interim, Chase's career had begun to flounder. The Three Amigos, with Steve Martin and Martin Short didn't clear $40M, Funny Farm made $25M and the ill-fated Caddyshack sequel crashed to $11.8M. Universal managed to convince both Chase and director Michael Ritchie to return for 1989's Fletch Lives. By that point there were eight other Fletch books that could have been adapted for screen, but the studio opted to create an original story instead, written by Leon Capetanos (Down and Out in Bevery Hills, Moscow on the Hudson and Moon Over Parador). The story would see Fletch inheriting a mansion in Louisiana and quitting his newspaper job to live the life of luxury. But when he arrives he discovers the place is completely run down, finds himself framed for murder and suddenly offered a huge sum of money for his apparently worthless piece of land. Reviews were mixed, but the film debuted at the top of the chart upon its release. While history has largely forgotten Fletch Lives, it actually did ok at the box office, making $40M (again, against a budget of $8M). Chase would hit the big time again in December 1989 with Christmas Vacation, but three back to back failures (Nothing But Trouble, Memoirs of the Invisible Man and Cops & Robbersons) saw him cast into the wilderness for many years. A failed chat show did little to help matters and his reputation for falling out with co-stars and production staff was as bad as it had ever been. He would continue to work fairly consistently, and even returned to the role of Clark Griswold for Vegas Vacation in 1997, but it would not be until 2009, and his appearance in the sitcom Community, that the actor was again back in the limelight. While he would leave the show in 2012 amid disagreements with Dan Harmon, it gave him the break he needed. At the time of writing, he has returned to the role of Clark Griswold for a new Vacation movie, that will see Ed Helms as his son, Rusty, taking his own family on the holiday of a lifetime. Post-Fletch, Michael Ritchie re-teamed with Chase on Cops and Robbersons, before directing The Scout, Fantasticks and A Simple Wish. He died from prostate cancer in 2001. Actor Tim Matheson continued to work at an incredible pace, moving between film and TV. In recent years he has had recurring roles in The West Wing, Burn Notice and Hart of Dixie. Dana Wheeler-Nicholson appeared in a number of one-off TV episodes, along with turns in Tombstone and Fast Food Nation. Finally, writer Andrew Bergman continued to produce comedy scripts, and turned his hand to directing with The Freshman, It Could Happen to You and Striptease, amongst others. While no second sequel was forthcoming, a reboot of sorts has been talked about for at least 20 years. During his time working with the Universal Pictures subsidiary Gramercy, Kevin Smith (who had made Mallrats and Chasing Amy for the studio) talked about writing a third Fletch feature, that would once again star Chevy Chase. While the duo did meet to discuss the possibility, little movement was actually made. The actor would later go on to state that Smith had talked up the role over a dinner they had had, but never contacted him again. Smith tells it differently, and states that while they did meet for dinner, his Fletch movie was at least a year away due to him commencing work on Dogma. The director claims the dinner was a disaster, with Chase taking credit for all and sundry. He would take pot shots at Smith in the press for years to come. In 2000, it was announced that Smith would direct a new Fletch movie for Miramax, who had gained the rights after they had reverted from Universal. He opted to adapt Fletch Won, a later book of McDonald's that chronologically, was the first story in the series. It would see Fletch as a junior reporter just making a name for himself. Both Jason Lee and Ben Affleck were said to be in mind for the role. In the August of 2003, the studio announced that Smith was set to begin shooting in January of the following year. The director lobbied for Jason Lee but Miramax balked, claiming the actor was not box office material. By the time Lee was a household name thanks to My Name is Earl, Miramax deemed him too old for the role. A number of other actors were considered, and at one point, Smith looked to be moving forward with Scrubs star Zach Braff, but nothing came of it. He left the project shortly after and returned to the Viewaskew universe with Clerks 2. In 2006, Scrubs creator Bill Lawrence had taken on the job of directing Fletch Won (and an untitled sequel). In January of the following year, Zach Braff announced that Lawrence saw him as a young Fletch, but no deal was in place and the script was still being written. Three month later, the actor ruled himself out of the running, opting to concentrate on directing Open Hearts (a remake of a Danish film) instead. Lawrence himself would leave the project in June 2007, to be replaced by Steve Pink. Little more was heard of a Fletch remake until 2011, when Warner Bros. gained the rights. They set a number of writers to work on separate drafts but all were deemed unsuitable. In 2013, writer David List, who represents Gregory McDonald's estate, submitted his own draft. This new script was good enough to attract the attention of Jason Sudekis, who signed on board. The studio has apparently signed off on the script but as of January 2015, is still looking for a director. Fletch is still a terrific comedy-thriller. Chevy Chase claims it is his favourite role because it allowed him to improvise and utilize props and physical comedy. The character is never caught off guard, and has a line (or lie) for every situation he finds himself in – not dissimilar to Eddie Murphy’s Axel Foley. The film moves at a cracking pace, and while the plot does seem a little convoluted, Chase’s performance holds it all together, easily covering any cracks that may appear. It also stands up well to repeat viewings, allowing the character’s subtleties and wisecracks to shine.